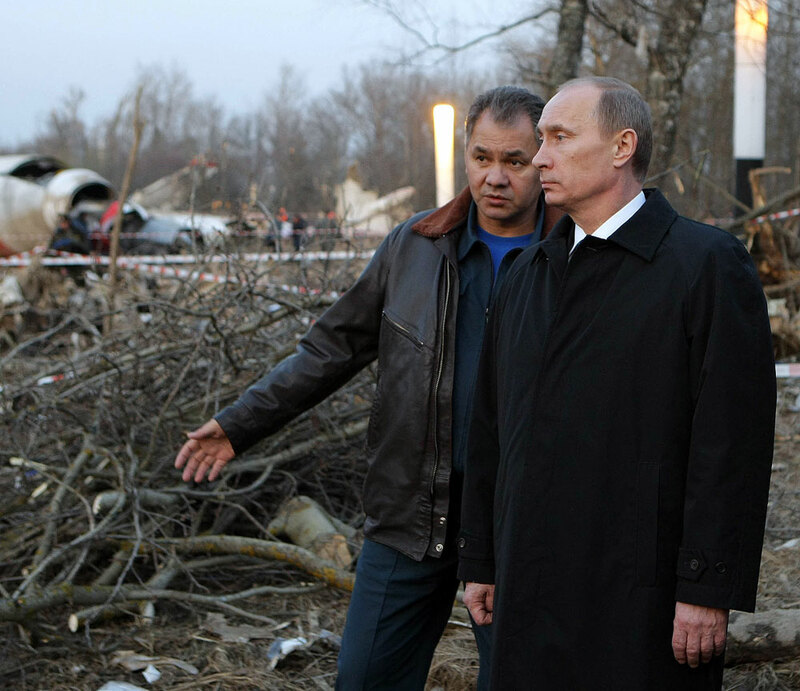 Russian Prime Minister Vladimir Putin, right, and Emergency Situations Minister Sergei Shoigu inspecting the Polish Air Force Tu-154 plane crash site near the Severny airport outside Smolensk on April 10, 2010. The Polish prosecutor's office has accused Russian air traffic controllers of deliberately provoking the crash that killed President Lech Kaczynski on April 10, 2010. He died when the Polish Air Force plane in which he was travelling tried to land at Smolensk-North Airport. "The charge is that the crash was provoked deliberately," Deputy Prosecutor-General Marek Pasionek told a news conference on April 3. The prosecutors came to the conclusion after repeatedly analyzing the case, encompassing more than 2,000 documents. Alongside the charges against the Russian air traffic controllers are accusations that a "third person" was involved, who on the morning of April 10 was allegedly in the air traffic control tower. However, the charges say nothing about who the "third person" might be. The Kremlin has rejected the Polish prosecutors' charges. "It’s impossible to agree with such conclusions," presidential spokesman Dmitry Peskov told the media. He said that Russia was pushing ahead with its own investigation into the incident. "The circumstances of that tragedy have been thoroughly studied by now," he said, adding that work on the case will continue. The Tupolev-154M aircraft crashed near Smolensk in thick fog, killing all 96 people on board, including President Lech Kazcynski and his wife Maria. A high-ranking Polish delegation was on its way to Katyn for commemoration ceremonies. The crew made the decision to land in bad weather and very poor visibility. The plane crashed a few hundred meters short of the runway after hitting trees. Russia's Interstate Aviation Committee concluded that the crash happened due to mistakes by the crew, who under psychological pressure made the wrong decision to land in bad weather. The Polish inquiry mentioned a variety of factors contributing to the deadly crash, such as the crew's decision to lower to an "impermissible altitude" and to ignore signals from the Terrain Awareness and Warning System (TAWS). Polish experts said that the accident happened because the aircraft "descended below the minimal altitude at excessive speed without having visual contact with the surface and a belated decision to re-ascend for a second circle."